How many times can one room be redone? When we first bought our home new, there was carpet in the BATHROOM. Ugh…why do they do this? So, almost immediately, after realizing that two young boys and carpet around a toilet do not belong in the same house together, we tore it up. Luckily, there was linoleum underneath. We scratched our heads. Why? Oh Why? Would someone put carpet OVER linoleum. But…alas…I digress. I have promised a post on the remodel of our kids’ old bathroom, now that we are empty nesters. The bathroom now belongs to my husband. Our master bath is no longer good enough for him. We have put together quite a lovely, masculine, spa-like retreat in our new bath that he just can’t bear to give up. So, after all the stress of dealing with the terrible contractor debacle mentioned in our Contractor Pros and Woes post, and finally hiring our all-time favorite contractor to complete the job (fantastically I might ad! 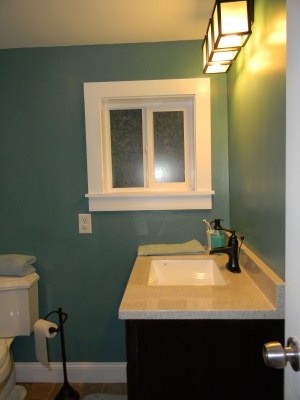 ), we have a bathroom remodel to share with you. Everything we change in our home, we change with an eye to our future. What will our needs be as we get older? Well, we didn’t figure we needed a bathtub in two bathrooms any longer. I have a nice soaking tub in our master bath…a shower in the second bath will be quite enough. This room remodel began with the original gypsum wall board on the walls. This had to be removed and all nails and trim pulled out as well. A rectangular piece was removed from the floor over the plumbing in order to reconfigure the fixtures for a new shower treatment. There’s a metal beam that runs through the floor under the area where the plumbing for the shower is. The former plumbing ran above the floor, so, an interesting reconfiguration in the floor with zero inches to spare got us a nice widened drain with a j-trap that works pretty great. The drain in the a standard shower pan is 2 inches. This is larger than most double-wide bathroom fixtures. I liked it because it allows water to drain more quickly and makes for less clogging. The wall the toilet is on is the exterior wall. The wall on the other side of the shower is a support wall that had to be torn down and rebuilt. Twice! 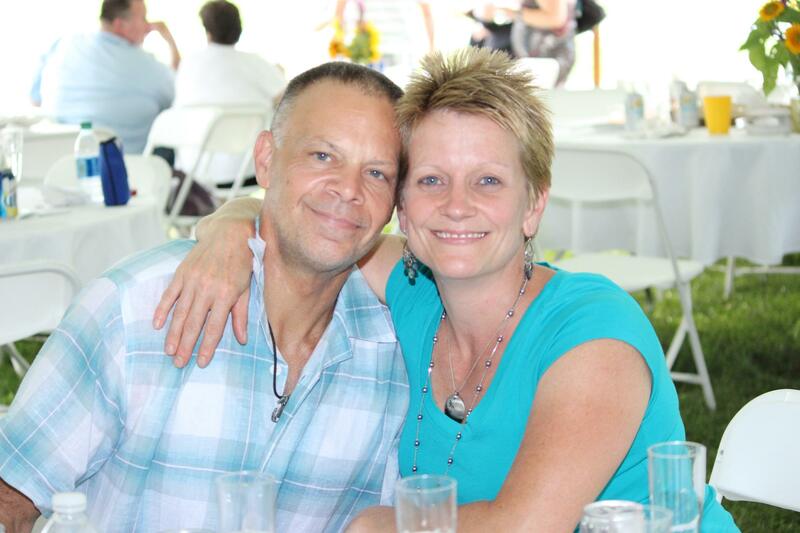 If you read our Contractors Pros and Woes post, you will understand why. The original wall that was behind the bathtub didn’t allow for enough space for the shower pan, so it had to be moved out a bit. This is often the case in a double wide. Sometimes the fixtures are not standard sizes. But, those walls are just four 2×4’s and they come down pretty easy. Just be careful of the plumbing inside and be sure to retain any venting that is there for proper plumbing flow as well. All of the walls and the ceiling were sheet rocked (Uh, bubye popcorn!) and we love it. The original sky light was removed from the ceiling and a new small window put in to allow light into the room. We put window film in a rice paper pattern over the window and we love the look! This product can also be found at Home Depot in several different patterns. The vanity we purchased at Lowes is great. Style Selections Espresso Almeta Cabinet is a really lovely dark chocolate color. I’m not sure of the brand of the shower stall we used, but we purchased it at Home Depot. 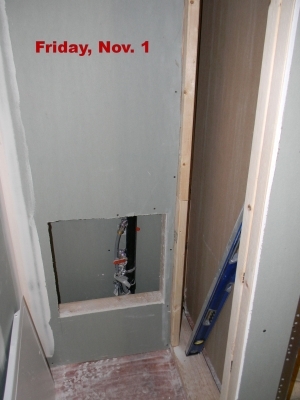 It was a 42″ walk-in shower pan with a glue on surround. 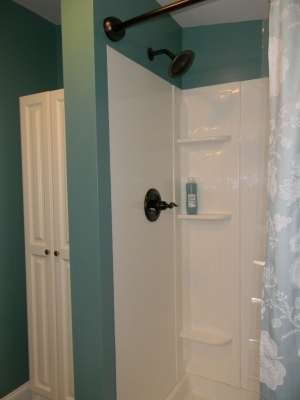 We always use a crescent shower rod to give the illusion of more space in the shower stall. We chose a bronze rod to match the water fixtures. This time, we tried a new style of faucet and loved it so much we replaced the one in our master bath to match. The Giagni Andante Vintage Bronze Faucet is a style that is reminiscent of an old handle water pump. The Delta Windemere Oil-Rubbed Bronze shower fixture is really lovely and terrific because Delta fixtures are guaranteed for as long as you own the product, plus, it’s the type of fixture where if you want to replace it, you can do it all from the front of the shower. You won’t have to mess around in the back of the shower wall to do it. 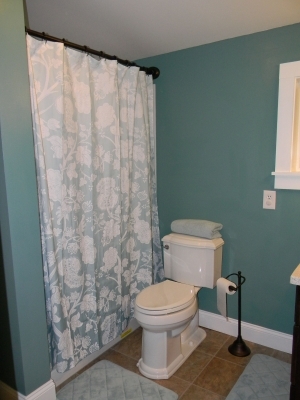 Finally, we enclosed all of the plumbing with a cover panel and our contractor painted the whole room and put new baseboard and door trim up. 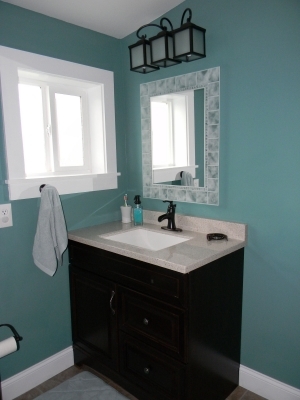 The wall color with the dark fixtures and vanity are a very masculine look and it feels almost spa-like when you’re in the room. The Glass Block Deco Mirror is a finishing touch that matched perfectly and was purchased at Home Depot as well. 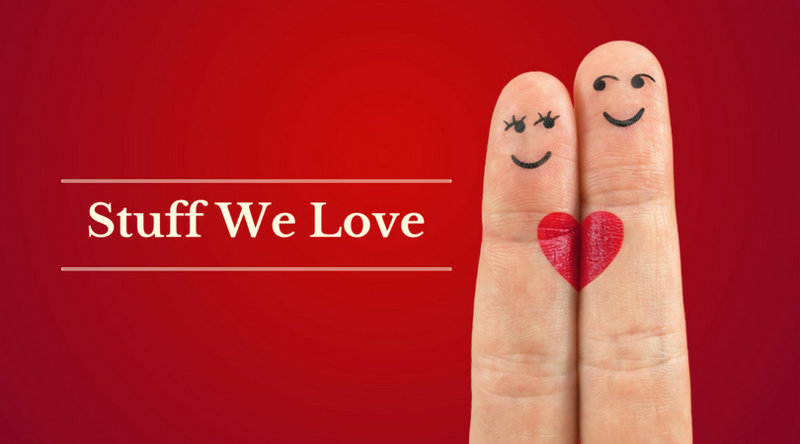 Check out the pics in our gallery! To see larger images, click on the “fs” in the lower right of the gallery to view in full screen. Faux wall to hide plumbing. 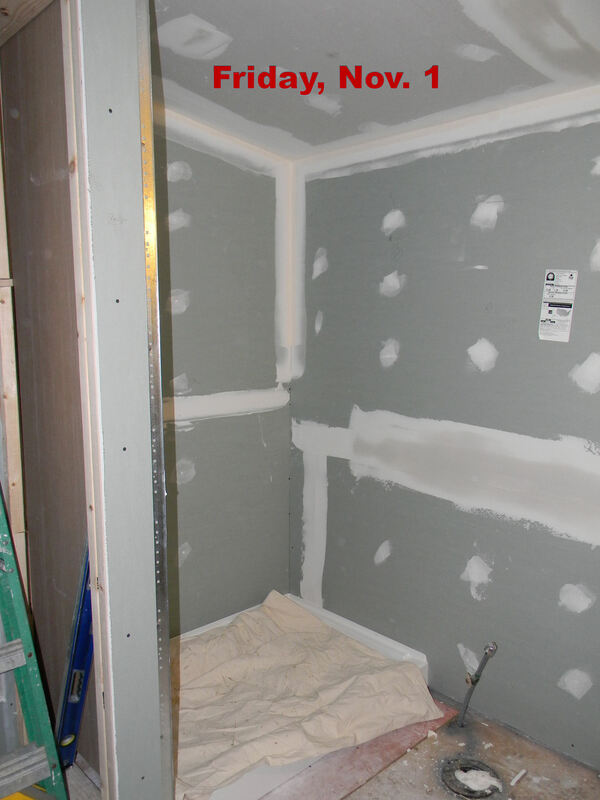 Shower stall area framed and sheet rocked. 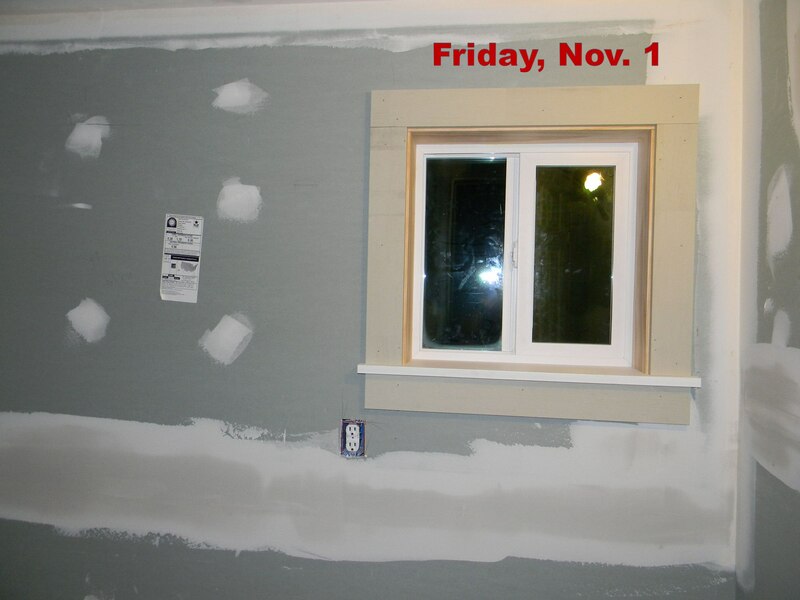 New window and sheet rock. Window framed and new sheet rock. New window, vanity, light, and mirror. 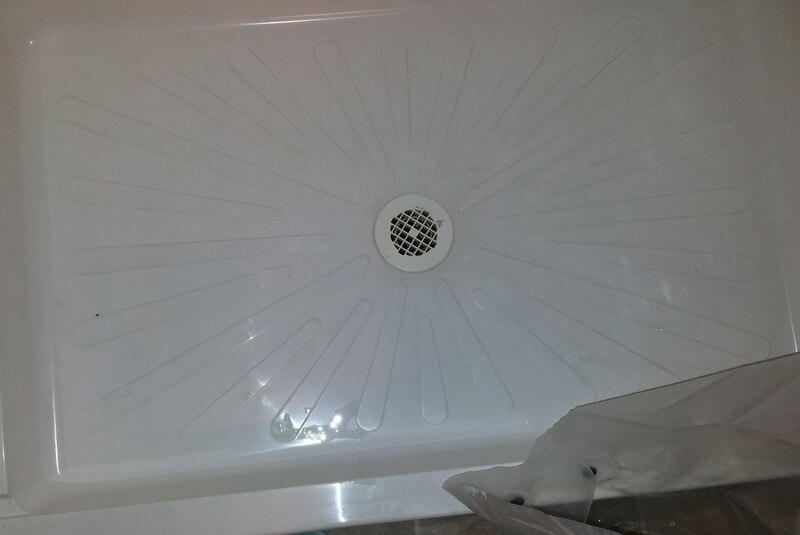 Shower pan with glue-in shower surround. New Kohler toilet and shower. The supplies for this bathroom remodel cost less than $1500.00. The hassle of hiring the first contractor to complete some of the work for us, plus hiring our favorite contractor to fix the first guy’s mistakes and to finish the job was about $1800.00 additionally. This bathroom was the most expensive room we have ever redone. A simple 9’x7′ room caused more headaches than any other project we’ve shared on this site so far. And that’s sayin’ somethin’! 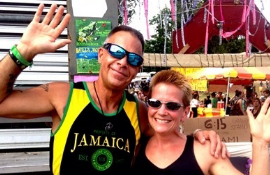 We are relieved it’s done and we won’t be doing it again….EVER! The older we get, the less we want to do ourselves. While this is true for the most part, we did just undertake another entire living room remodel that took us months of weekends to do and drained us physically to no end. But, we are winding down with that and just doing the finishing paint touches at this point. I will be posting about that one very soon, so keep in touch! We LOVE this bathroom and are so happy with how it turned out, even if it did cost more than most projects we’ve done. Big D has taken this bathroom over as his own. Oh well. I still have my lovely master bath! If you have any questions about this bathroom remodel, please feel free to ask in the comments below. If you have done a bathroom remodel you’d like to share, please do the same. We love to get comments and always respond. The previous red was definitely a bold choice. It looked good, this new color however is great and gives it a sense of tranquility, in a manly way of course. Your bathroom is simple and stylish i like it very much thanks a lot for such a nice sharing. Hi Bill. Thanks so much for your comment and for visiting our site! The smaller walls in the bathroom that we have changed were the short width walls (about 2.5 feet) that were behind the bathtubs that contained the plumbing and provided a surround wall for the shower. These walls were just made of 2x3s and came down with one snap of a hammer practically. We also removed a wall about the same size in our living room that sort of stuck out into the room and served as a tiny “hallway” to the bathroom and bedroom. Seriously, this wall was only about 2.5 feet….and annoying. We removed it when doing our living room remodel recently and the wall did not provide any sort of support for the ceiling at all. We also removed a pantry closet in our kitchen when we remodeled that room. 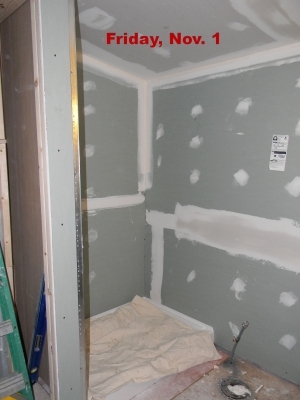 The two walls that were the surround of the closet were the same 2×3 material and just came right down. There is no chance these walls were supporting anything. They were barely screwed into the ceiling. Although, where they did have screws, they were about 6 inches long and took forever to take out! We also removed a wall between our bedroom and our walk in closet to open up the room and make it more like a “suite” with an open closet and work space. I would NOT do any removal of any center walls…EVER. We did redo our laundry room recently and needed about 2 inches more of width to accommodate our washer and dryer to be side by side. Our contractor did remove part of this wall and “recessed” that portion of the wall, while not really removing the top beam and leaving support beams at the two ends of the wall, so the support is still there. These center sections are support, weight bearing areas and shouldn’t be completely removed. The exterior walls should also not really be messed with. We have debated taking our a couple of our gigantic windows and putting in a sliding door. We have changed our mind on that because we are unsure of what that would do to the support in the side of the house. For all we know, it could be okay, but we don’t want to take the chance. I found this description helpful in describing what is and isn’t possible with regard to load bearing walls in mobile homes: WHERE ARE THE LOAD BEARING WALLS IN A DOUBLE-WIDE MOBILE HOME? 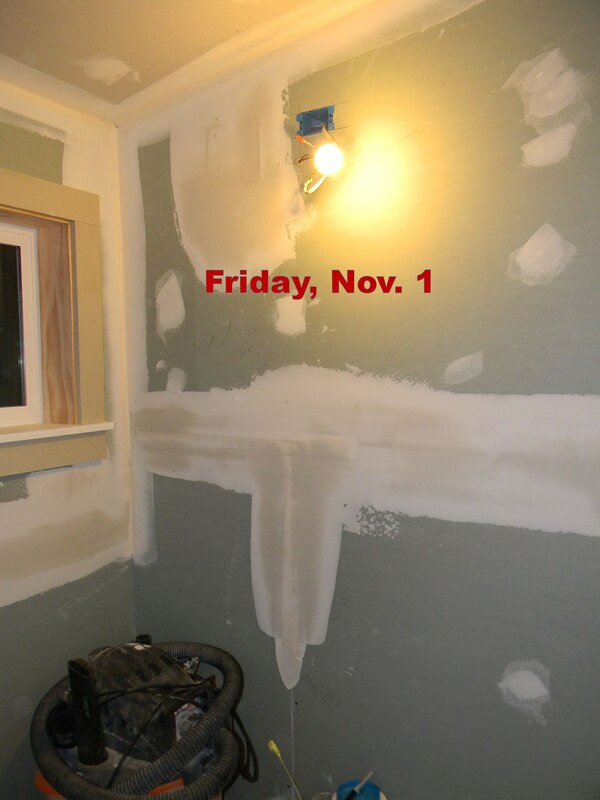 on the Florida Home Inspection Blog. Good luck with your remodel and keep checking back. You’ve given me an idea for a good post…a pictorial display of all the walls we have removed! Love, love, love your bathroom, can't wait to do ours. We have already removed the garden tub but will have to wait a while longer due to we are finishing our kitchen ; ). You have answered so many question for us when we are ready. We have also discovered the Sierra Slate laminate flooring and love it, we put it in our kitchen and dinning room and now I want it everywhere! So easy to clean and it hides a lot. Thank you so much for your web page, remodeling a mobile home is sometimes not easy and it's great to have you to turn to. Hi Phyllis. Thanks so much for your comment. I'm so glad you're in process with your remodeling projects and I hope your kitchen is done soon. If you think of it, please do come and share with us how it went. We'd love to hear about your experience and hope you can share your successes as well as any issues you were confronted with and how you resolved them. We have made some really big changes here recently. Stay tuned for some upcoming posts. We did a major overhaul of part of our home and, while it took us many weekends to do it, it is finally finished and we are really relieved. It almost feels weird not to have things to work on all the time! Now maybe we can spend some time building furniture, which is something we really enjoy. Let us know how things go and thanks again for your comment!